The Portland Art Museum is committed to providing meaningful access to as many people as possible. Mickalene Thomas’s Do I Look Like a Lady? is a video installation that features moving images projected onto the wall that reflect onto the floor. The exhibition space has low lighting, and the projection features bright lights that create a flickering and flashing effect at times. It also contains a soundtrack. Staff are happy to assist and if you have questions before you visit, email access@pam.org or call 503-226-2811. We will do our best to accommodate your needs when you arrive, however, we need 2-3 weeks advance notice for specific requests such as tours with verbal description or ASL interpretation. Please email requests to access@pam.org, or call 503-226-2811. Aides and care-providers receive free admission. Manual wheelchairs are available free of charge. T-coil compatible FM listening devices and neck loops are available free of charge at lectures, films, and tours. If you would like to request an ALD for a tour, it is helpful if you can let us know ahead of time by emailing access@pam.org or calling 503-226-2811. Docent-guided tours with verbal description are available on the third Thursday of each month or by request with advance notice. 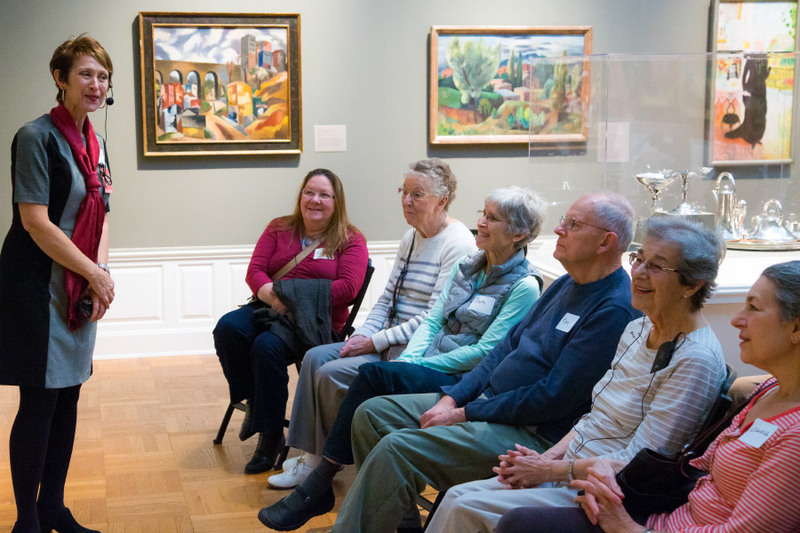 The artNOW program offers docent-led tours on select Mondays. Call the Alzheimer’s Association at 1-800-272-3900 for more information and to RSVP. Reduced prices are available for visitors through our Admission Access Programs. The museum’s library is open to the public by appointment. There is one wheelchair-accessible entrance into the museum located next to the outdoor sculpture garden between SW Park Avenue and SW 10th Avenue. There are two metered accessible parking spaces on the museum side of SW Park Avenue, and two across the street from the museum on 10th Avenue. The paid parking lot next to the museum has four accessible parking spaces. For Trimet Lift and rideshare passengers, there is a loading zone with a curb cutout in front of the museum at SW Park Avenue and Madison Street. The Art Museum stop on the NS and A loop streetcar lines. The SW 11 and Jefferson stop on the NS and B loop streetcar lines. The SW 10th and Jefferson bus stop serving lines 6, 38, 45, 55, 58, 68, 92, and 96. We know the museum can be confusing to navigate. Please ask one of our staff members if you have any questions. The museum consists of two main buildings with galleries and event spaces that are accessible by stairs and elevators. All restrooms have accessible stalls but no power doors. There are single-stall gender-neutral bathrooms available. Please ask staff for directions. If you have suggestions about this page or our accessibility services, please email access@pam.org, or take a moment to fill out this survey.